One Month til 25th Historical LeBarge Cruise !! The Historical Society of Sarasota County (HSOSC) is hosting its 25th Historical Cruise and Tour of Sarasota Bay on the LeBarge tour boat on Sunday, November 2, 2014 from 11am to 1pm. The cruise will feature narration by popular local historian John McCarthy. Guests can expect a complimentary continental breakfast and a cash bar at noon. 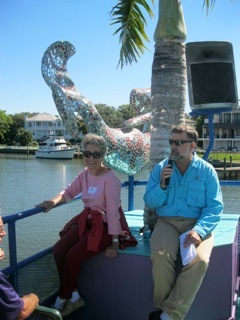 Norma Kwenski, Volunteer Extraordinaire, grabs the catbird seat on LeBarge, next to our commentator, always-captivating John McCarthy, one of Sarasota’s leading historians. This specialty cruise tour has been a favorite with residents and tourists alike who want to learn more about the bygone people and places that have impacted the development of Sarasota County. Guests cruise along the shoreline of Sarasota Bay and enjoy the sunshine and refreshments while John McCarthy paints a picture of the formative years in Sarasota’s growth. Historical Cruise Guests should be at the LeBarge slip, south of Marina Jack in Sarasota’s Bayfront Park by 10:15am, rain or shine. Proceeds benefit preservation projects and community outreach programs at the Historical Society of Sarasota County. This entry was posted in People & Places and tagged Le Barge. Bookmark the permalink. ← Black Bottom, Overtown, Newtown, Rosemary District: What, where, when.